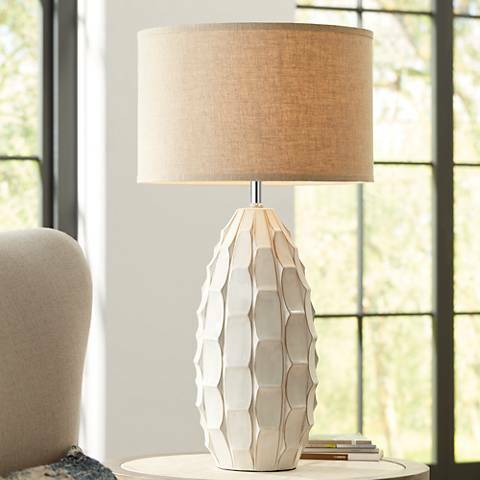 Discover fresh ways to bring new style and visual appeal to your home, all by decorating with the humble table lamp. Table lamps often have been treated like the old maiden aunts of the lighting world, but as we will see, they’ve undergone something of a makeover and are turning up in surprising roles in surprising places. Far from being stuffy and old-fashioned looking, they are showing off fresh finishes, bright colors, and beguiling textures that will delight the eye. Here then, our eight ideas for decorating with lamps. 1. Most people think ceiling fixtures when planning illumination for their dining areas, but in intimate—read, tight—spaces a table lamp creates a café ambiance, particularly when they’re painted in unexpected contemporary colors. 2. A nightstand lamp is a must, of course, but there’s no reason not to mix and match styles and to introduce styles usually reserved for more formal spaces. 3. The new table lamp seems to have the biggest impact when it’s used in unexpected places. Why not integrate one into your bathroom décor for a touch of elegant whimsy? In this case, it’s the element that seems to pull an imaginative and stylish bath together. 4. Candles on a window sill are a traditional touch, but you can update convention and create a wonderfully reflective pool of light by placing a table lamp there. It signals welcome to those outside and a bright glow of companionship to those within. 5. Even when they’re asked to play one of their traditional roles, today’s made-over table lamps give you the opportunity to turn the oh-so-familiar into a contemporary statement. A sideboard with rococo and classical design elements has been updated with a white-washed, distressed look. 6. Giving the tall, sculptural lamps similarly styled base the same treatment brings both light and unity to a dining room tableau. A very modern table lamp sitting on a battered but very contemporary side table turns a sitting room design cliché into a fresh declaration of time and place—not to mention, personal taste. 7. Somehow, when the eye goes to a fireplace, the mind thinks: sconces. That’s certainly one way to go, but tall table lamps—particularly in a matching pair—are an unexpected and decidedly elegant alternative. This is one time when seeing double isn’t such a bad thing. 8. Similarly, a pair of matching table lamps that might usually expect to find their place on a bedroom’s nightstands, look particularly strong arranged side-by-side on a low dresser. (In the setting above, two lamps serve as sculptural art.) With all that extra light, there’ll be no more fumbling for lost earrings or keys!